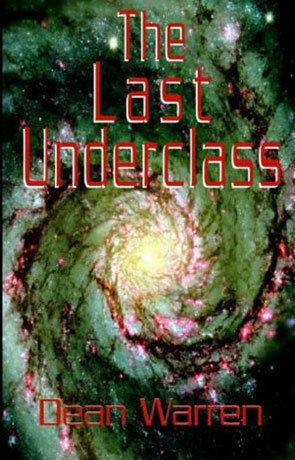 The Last Underclass is a science fiction novel by Dean Warren. A hundred and fifty years in the future, the world has polarized in to winners and losers, has and has-nots, in this book they are called Welfies and Achievers. Ghetto born and raised Quiet is a Welfie to the core. Trying to raise money for his sick mother he decides to get money the only way he can. Steal. Stupidly he decides to steal from one of the richest men in the world "The Starman", luckily, for him, he does it at exactly the moment where The Starman is attacked by his enemies, so Quiet ends up saving The Starman and his family including his beautiful young daughter. The Starman takes Quiet under his wings and helps him into military school (the only option, for a young Welfie). Soon Quiet gets thrown from secret plan to underhanded plot, from fire to ashes and ... well, he gets around. He soon ends up with the fate of the entire planet in his hands. Can he, a simple Welfie, save the world, even with his new powerful friends helping him? There's not stopping the action in this one, but what did made me stop, was the fact that Warren take a quite negative attitude towards technology in this one. Not something that you see very often in science fiction – this comes as close to Luddite science fiction as I've ever seen. Most of the scientists are bad, if not downright evil, people. The technology in the story is mostly seen as bad, and their positive sides are often ignored, the only time medicine is used for good (saving Quiets mom), it gets less than one page and nothing special is made of the fact that it's actually possible to save her with "lab-grown replacement organs". And then there's the irony of Quiet himself, but I can't go further in to that without spoiling the story for you. I think that it's fine that Warren takes the time to take a good hard look, at the problems uncritical and unchecked usage of technology can give us, but I also think that he does it a bit too one sided and heavy handed. Recommended for the simple fact that it's different. Written on 29th May 2002 by TC.